DIY decorating projects aren’t just great for saving money. I love the feeling you get when create something that is exactly your vision and absolutely unique. And it’s even more fun when you can share the experience and results with friends. I’m so pleased to introduce you to Ari, my friend, neighbor and fellow working mom/ lover of crafts and decorating. We’ve worked together on quilts for the school fundraiser and shared great times painting furniture and antique hunting. Recently, she got the inspiration to paint decorative trays, and I caught the bug, too. We picked up some old trays at the flea market last week, and Ari wasted no time getting to work! Here’s the tray she started with, which is one if a pair she picked up for $15 total. This play tray has a cool mid-century feel, but it’s definitely plain. Just wait until Ari works her magic! 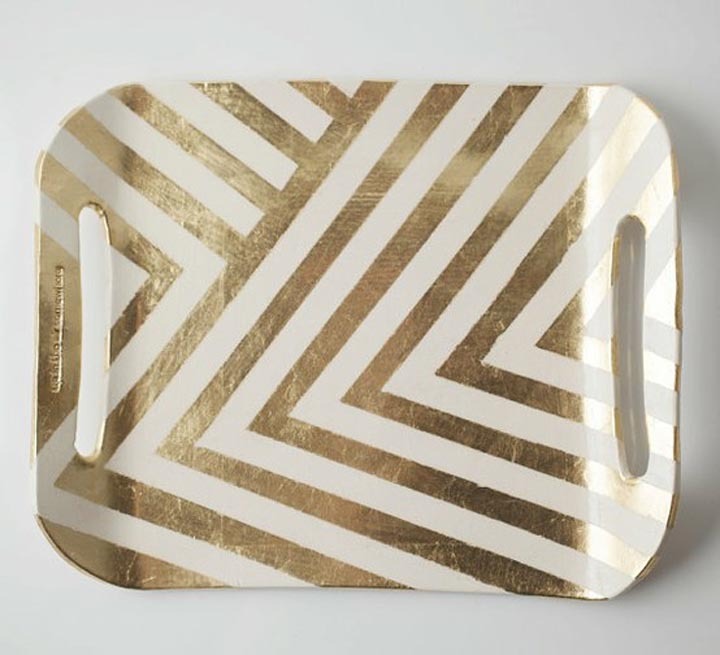 Using an inspiration she had found, which is included in my earlier post on ideas for decorating trays, she decided to paint gold stripes on it for her dining room. To start, she painted the inside of the tray with a base of white and let that dry overnight. Then she used blue painter’s tape to mask off this great stripe pattern. Chevron and zig-zag patterns are so popular right now, and this is a great play on that idea, without feeling overly trendy. There are metal corners on her tray, so she masked those off, too. Use blue painter’s tape to mark off your pattern. This is a nice play on the popular chevrons and zig-zags. Now for the fun part, she sprayed the entire tray with metallic gold spray paint. After letting it dry thoroughly, she removed the tape, and WOW! I can hardly recognize that plain old tray. The result is so sophisticated and will look great in the dining room. A glamorous transformation for a flea market find. The gold really shimmers and the stripe pattern is so sophisticated. We have more big plans for decoupage and stencils on trays. I’m also thinking this technique would look great on a wooden box. Come back soon to see how everything turns out. The best decorating projects combine form and function – they add beauty to your space, serve a purpose, and when you make your own, they are one of a kind! A decorative serving tray is just this kind of project. You can use them to display or transport items on a coffee table, buffet, desk, kitchen counter, and more. My friend Ari got me excited about decorating our own trays when we were at the flea market this past weekend. 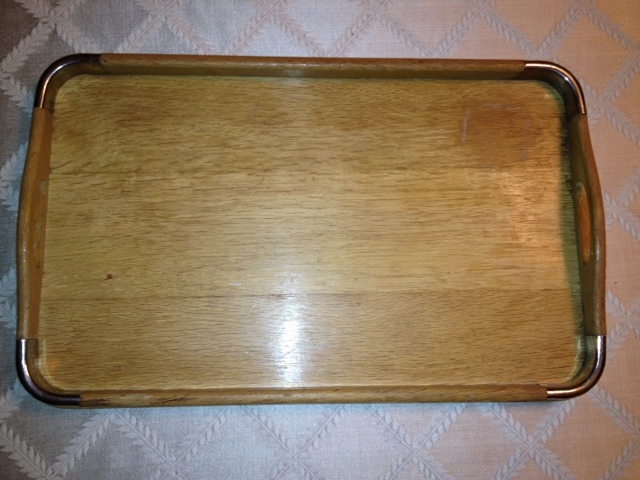 I picked up an older wooden tray there for just $5, and I know I have a couple of my own lying around the house. I want to use some for display in the living and dining room, and one for the desk in my craft room. There are so many great ideas, and here are some I would love to try or adapt for myself. The botanical silhouette and silver leaf on this tray are beautiful. 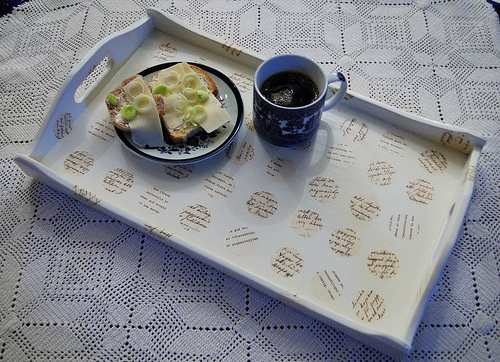 Brenna at Design Sponge has a tutorial for how she made this tray from a thrift store find! You could simplify it for a similar look with silver spray paint, though the silver leaf looks amazing, and the glass makes the tray useable for serving. Lots of options to personalize a monogram tray from A Modern Style on Etsy. This one is by A Modern Style on Etsy. I love the bright colors and graphic design contrasted against the wood. Gorgeous lacquered trays with wallpaper inserts and bold colors from iomoi. This is from iomoi and hand lacquered, so it would be very durable and stand up to washing and heavy use. 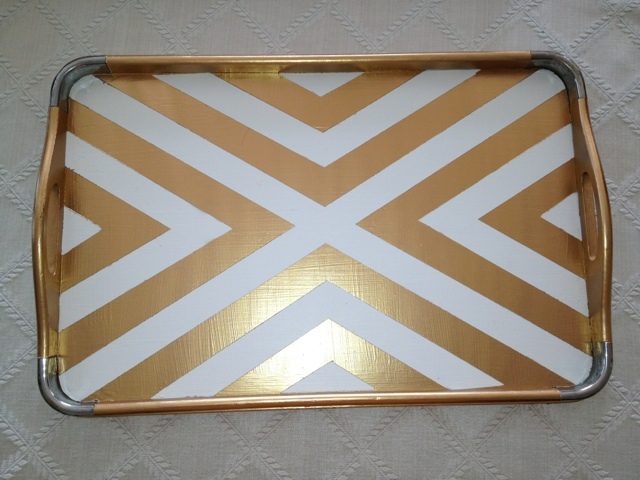 The coordinating colors on the body of the tray and the gold trim are gorgeous! I could use some more of the Imperial Trellis wallpaper I have left over from our powder room and lining our bookcases. 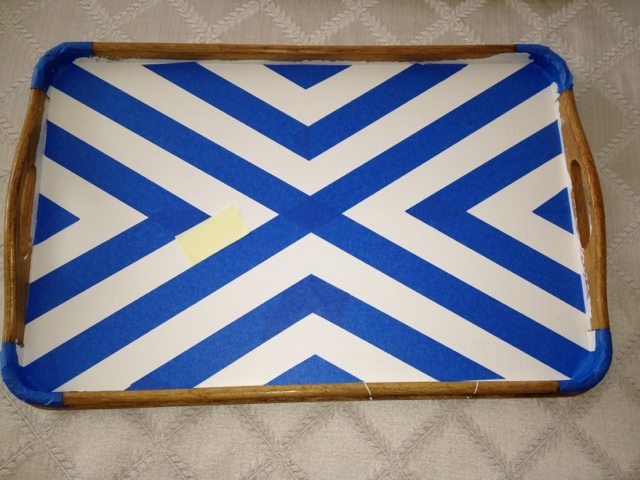 Use painter’s tape to mask a design on a plain tray (or paint the tray a background color first). Follow with spray paint – looks great in metallic for a striking graphic design. Courtney Kaye of Courtney on the Brink made these trays for holding jewelry. They look bold and elegant! I’ve been using metallic spray paint for a lot of projects recently, and I love it! A tile mosaic looks beautiful inside this tray. This beautiful example, as well as instructions for tiling the inside of a tray, are from the Martha Stewart. This is an idea to make a tray from a frame and cabinet handles. You can put fabric or pretty paper under the glass. Patrice from Lemon Tree Creations had this creative idea for making a tray from a frame and cabinet handles. The glass protects the decorative fabric or paper. This stenciled tray is so elegant. I love the painted grey exterior with the white and grey graphic design. The instructions for stenciling this tray are from HGTV. Of course, it looks so much like my Imperial Trellis wallpaper, that I could use that for the same look, but there are other great stencil ideas out there, including stenciling words. A sweet little tray made from paper mache and painted different colors inside and out. Start from scratch! The instructions for making this paper mache tray are at Everything LEB. I love how she used metallic paint inside and the sweet green-blue on the outside. These cute circles have text from old books on them. You could do the same with all sorts of fabrics, papers, and shapes. A fun and unique example of decoupage from iHanna. There are so many great ways to build on this idea! This photo in sepia tones looks beautiful mounted inside a tray. You could print a single large photograph or several small ones and decoupage them to the inside of a tray and/or mount under glass. This lovely example is from Merle Hillary Interiors. These lacquered trays from West Elm are already gorgeous. You could dress them up in so many ways! If you want a tray that is already beautiful on its own, these trays from West Elm are a great option. With a simple design and so many colors to choose from, they would also be easy to customize. Only trick I foresee is that it might be a little tricky to get things to adhere well to the lacquer. For a simple unfinished wood base, try this Walnut Hollow Unfinished Wood Serving Tray, 15-inch x 11-inch . 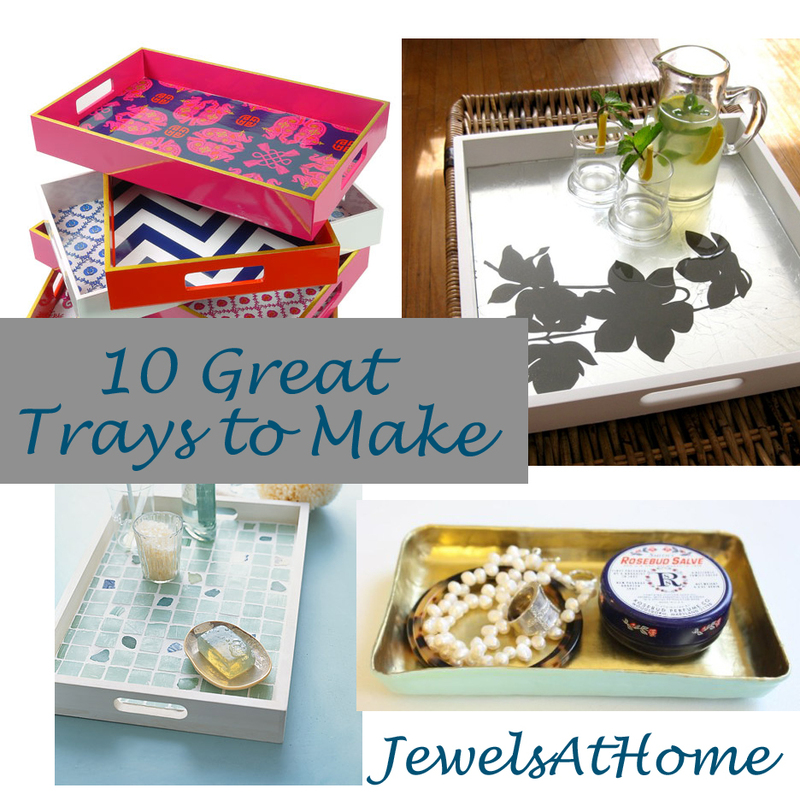 Well, that’s my roundup of inspirations for trays to make yourself. I hope Ari and I can find some time soon to work on ours!